Classical elements were once seen across many cultures as the vital parts and principles that govern the fundamental distillation of everything essential to life. In western culture those elements were Earth, Air, Fire and Water. The concept helped philosophers to organize their worldviews – to think about what is important and create a construct for understanding the world. Thinking of applications at the core of modern businesses we could create a similar construct with the crucial elements as speed, quality, control and cost. Speed is fundamental to competitive execution and market positioning. Quality is vital to successful implementation and long-term viability. Control, the command of data use, security, access and process is crucial to safe operations. And cost, of course, is a pivotal consideration in nearly all business decisions. 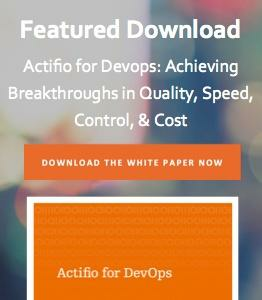 Suppose we use these four elements to assist in defining how data virtualization and the functional elements of Actifio technology impact application development, and DevOps in particular. Enterprise IT exists to support the objectives manifest in business applications. The need is essential and the pressure for faster execution constantly increases. Applications are a number one priority for CIOs because the results they bring are a number one focus of CEOs, customers and shareholders. Every line of business will regularly have new requirements. They’ll need a new app or changes to improve existing apps. They could be in-house, customer or partner facing but acceleration of application development means the acceleration of business. Apps bring competitive advantage and revenue. So, if the essential IT mission is to host applications, they need to get all that surrounds them accomplished with quality, innovation, efficiency and speed. Always speed. The speed challenges can be divided into two categories – process and physics. Consider a common process scenario – before data virtualization – where a developer needs a production database copy for the start of a new project. Data access is requested, and a ticket submitted for approval. Next, someone needs to provision compute and then storage. Then a DBA needs to create the database clone so that the data can be manually masked. Activities across time zones might introduce additional delays before the developer finally gains data access. Typical elapsed process time – two weeks to a month. Maybe more. Seldom less. But we’re still not set to go. There’s still the physics problem. Suppose the first production data copy is ready. Now additional physical copes are needed to satisfy prototyping, QA, user testing etc. The simple math is that creating five or six physical copies of a 5TB db over a one gigabit network will take five days. After the data ages the same process and time delays are built-in every time the developers request a refresh. Think about an SAP or Oracle ERP environment that comprises over ten copies and you begin to get the built-in delays. Now, introduce data virtualization. Actifio. Imagine a data platform that already has copies of the production data and can non-disruptively access those copies and repurpose them for development and test environments. With masking automated, development and operations staff only have access to clean data. Privacy and regulatory can be built in. Because it’s a self-service environment developers get near immediate data access and simple regular refresh when they want it. Data virtualization is a natural progression that follows server and network virtualization. It helps automate workflows, enables on-demand data access and delivers provisioning measured in minutes instead of days. For DevOps it’s an alternative that enables rapid development, testing, release and refresh of applications with as much as 90% reduction in provisioning times. Data virtualization means application development with an exceptional edge.